Every day architectural enthusiasts from Buffalo and even around the world come to the downtown corner of Church and Pearl streets to gaze at the 13-story Guaranty Building. They admire the steel structure's pioneering verticality, and the lavish, nature-inspired ornamentation of the terra cotta facade. They can read a small plaque outside the building. But until now, nothing invited them inside or celebrated the still functional office building's history, other than a docent program for scheduled groups. That changed Thursday morning with the unveiling of the Guaranty Building Interpretive Center. The Hodgson Russ law firm, the building's owner, created the center at a cost of several hundred thousand dollars. The center is free to the public. "Over the course of a year, we have thousands of people who come to the building," said Terry Gilbride, a partner. "What we have done is give people an opportunity to understand why the world considers the Guaranty to be one of the important architectural treasures in our country, and is treated with reverence by architects and historians." Visitors will find museum-quality exhibits and displays built by Buffalo-based Hadley Exhibits that tell the story of the building and its architects, Louis Sullivan and Dankmar Adler. They're located in a former conference space in the northeast corner of the building. "What makes this so exciting is that these owners really recognize that this is a special place for Buffalo's culture, and they're welcoming the public in," said Jessie Fisher, executive director of Preservation Buffalo Niagara. "This is an amazing thing for Buffalo, and is something that is not so common in many cities." The event also kicked off Hodgson Russ' bicentennial celebration. The firm traces its history to 1817 and the attorney Asa Rice. Two presidents that century, Millard Fillmore in 1830 and Grover Cleveland, in 1855, joined the firm. Hugh M. Russ III, a partner, said the firm, as steward of the Guaranty, wanted to show appreciation of the National Historic Landmark that it purchased 15 years ago. He said the center also shows the gratitude the firm feels toward a community that has allowed it to become the oldest continually operating business in Buffalo. The firm helped with legal work to finish the Erie Canal and charter the City of Buffalo in the early 1800s. "We wouldn't be here as a firm without having received significant opportunities, and we'd like to think our involvement has made Buffalo a better place as well," said Russ, who chairs the bicentennial committee. "As we look forward to the next 200 years, we wanted to say thank you, and we're still going." When the firm noticed the declining use of its first-floor conference rooms four years ago, Gilbride thought the time was right to set up an exhibition that traced the history of the building and the architects who made it possible. Facilities manager Paul Pellegrino proposed a large corner space, and Gilbride, working with architects Peter Flynn, Michael Lennon and others, brought the project to fruition. A timeline tells the building's tumultuous history, including ill-fated modernization attempts, an interior fire and an out-of-town company that applied for a demolition permit after buying the building in 1977. It also describes the successful preservation effort headed by Jack Randall, a Guaranty Building manager who earlier helped preserve the Wainwright Building in St. Louis, the Buffalo building's predecessor. The timeline quotes Sen. Daniel Patrick Moynihan telling The Buffalo News he "would rather see the White House or Mount Vernon torn down" than the Guaranty. A $12.4 million restoration was completed in 1983. Hodgson Russ occupied three floors at the time, and would buy the building in 2002, when the Guaranty was in foreclosure and at risk once more. The firm embarked on a $15 million restoration three years later. Russ remembers doubts about buying the building because of its age and the maintenance problems that were sure to come with it. "There's been a fair amount of that, but it's really been amazing," Russ said. "The goodwill we've received more than repays us for our investment. I think we really do feel pride in having saved this building for the community. "Every day, people walk in and they want to see it. Often it's people not from Buffalo, but often it's Buffalonians, too, so it's pretty cool," he said. The exhibition includes a display of Sullivan, frequently cited as among the three greatest pioneering American architects, along with Frank Lloyd Wright, whom Sullivan mentored, and H.H. Richardson. A pencil sketch of a door plate by Sullivan is next to an actual plate. The exhibit also honors Adler, an architect with a skill for engineering, and the accomplishments of the Adler & Sullivan firm. The Guaranty would be their last – and arguably greatest – accomplishment. The building's importance in the development of skyscrapers is explored. So, too, is the story of Hascal Taylor, who commissioned the building, and for whom it was to be named before an untimely death two years before the building opened in March 1896. There are also displays on terra cotta, the building's fire-proof clay cladding, and the ornamental metal castings that bore Sullivan's distinctive style, from door handles to mailbox slots. 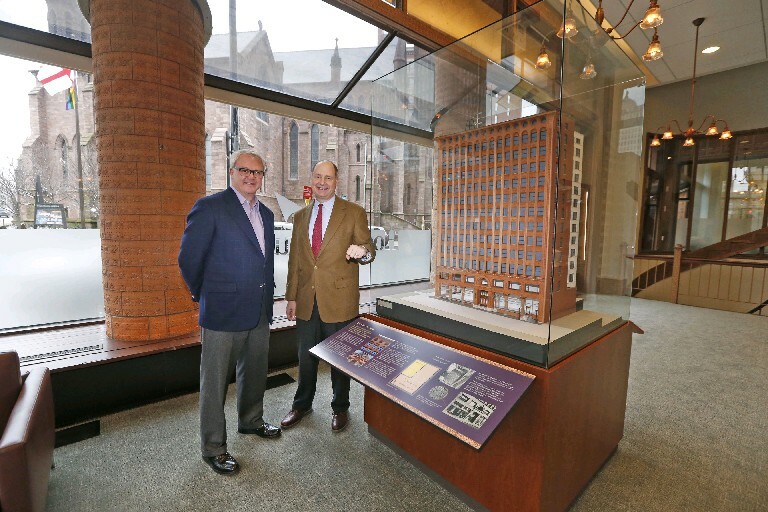 The exhibition also features a scale model replica of the Guaranty Building constructed by David J. Carli, a professor of engineering at SUNY Alfred. A 10-minute video by Marguerite Gilbride, Terry's daughter, and Justin Levine also tells the story of the Guaranty Building, with cameos from locals steeped in preservation and architecture. One of those featured, Peter Flynn, worked on the restoration in the 1980s as a principal with Cannon Design, and again with his firm Flynn Battaglia Architects in the previous decade. Flynn Battaglia Architects co-designed the exhibit with Hadley Exhibits, providing the narratives and historic research. Flynn called the small museum a great addition for the city. "I don't think Buffalo has had many things like this, where there has been a privately-sponsored effort in a commercial building to create an interpretive space," Flynn said. Mark Sommer – Mark Sommer is an enterprise reporter and former arts editor at The Buffalo News. He writes about an array of subjects, including development, the waterfront, transportation and culture.